There have always been certain musicians who possess a distinctive style that might not always be easy to describe, but is recognizable whenever you happen to hear them play or sing. For music lovers from the 1930’s to the 1950’s and beyond, pianist Frankie Carle – “The Wizard Of The Keyboard” – was one of those musicians. He was an early bloomer, playing professionally in his uncle’s band at age 13 and leading his own group while still in his teens. During the 1920’s he was part of the growing importance of “hot” music, performing in several different groups and building his resume. 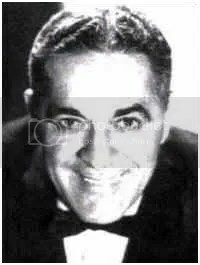 By the 1930’s, Frankie was a veteran and in great demand, both as a pianist and as a composer and arranger. One of his compositions during that period, “Sunrise Serenade,” was a hit for Glenn Miller and later became Frankie’s signature song. In 1939, Frankie joined the very popular Horace Heidt orchestra and over the next several years was an integral part of the group, although he was almost lured away by Eddy Duchin. The famous society bandleader had been drafted, and wanted Frankie to take over and lead his band – for a cut of the profits – while he was gone. Heidt made a counter-offer and Frankie stayed put, but a couple of years later Heidt retired and helped Frankie form his own band, which became very successful. The group not only did well in tours and record sales, but also had a popular radio show. In the 1950’s, the age of the big bands began to fade and Frankie wasn’t able to keep his group going, but he didn’t slow down personally. He continued to play in concerts and special appearances, and was musically active into his eighties. He died in 2001 at age 97.